PLEASE READ DESCRIPTIONS OF CHARACTERS BEFORE FILLING OUT FORMS! THANKS! Here you can find characters designed by me. You can adopt any characters on this page at ANY TIME, and will automatically added to my queue, whether or not my slots are open. I have a heavy preference to make fullsuits of all of these characters, but you may request as little as a head. If you want to claim one of these characters, 35% deposit will be due within a month of your claim. Just fill out the form below each character. Priced extra features are also available! These designs are special and have a few options: You may adopt one (Either Aqua on the left, or Lavender on the right) OR you can adopt both (for couples, friends, etc!). If you choose to adopt both, I of course would prefer if they stayed close, I'd love to see them together! They will have different spot patterns, despite being identical in the drawings. Once one of them is adopted, the other will NOT be available, so don't worry about having a randomly matching suit out there! These will be PLUSH style suits. They will be filled with polyfil all over to create a soft, cuddly, plush feeling. The suit is TWO parts: the head, and the body. Hands, feet, and tail are all attached with hand escapes on the wrists. This will have a BACK zipper- because of the udder. So much luck wrapped up in this design! 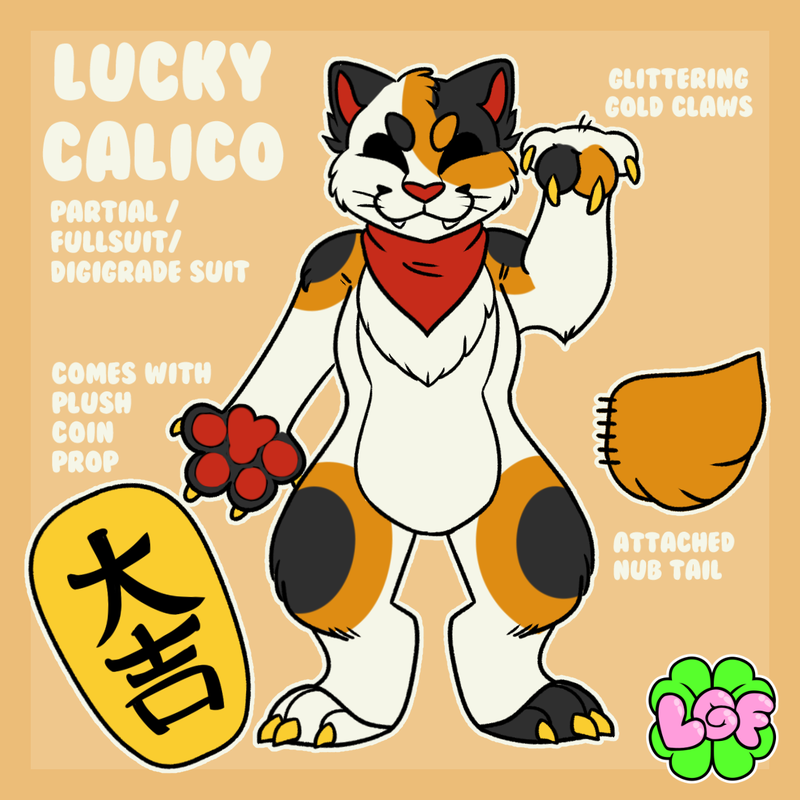 A cute, simple, asymmetrical cat that comes with a big plush coin prop and red bandanna. Claws will be golden sparkle vinyl, to add just the right amount of pazazz! Pretty straightforward design- potentially a very fun character for you to perform!